Last year, I was featured in a very interesting article about the most important employment laws that were enacted during the course of 2014. 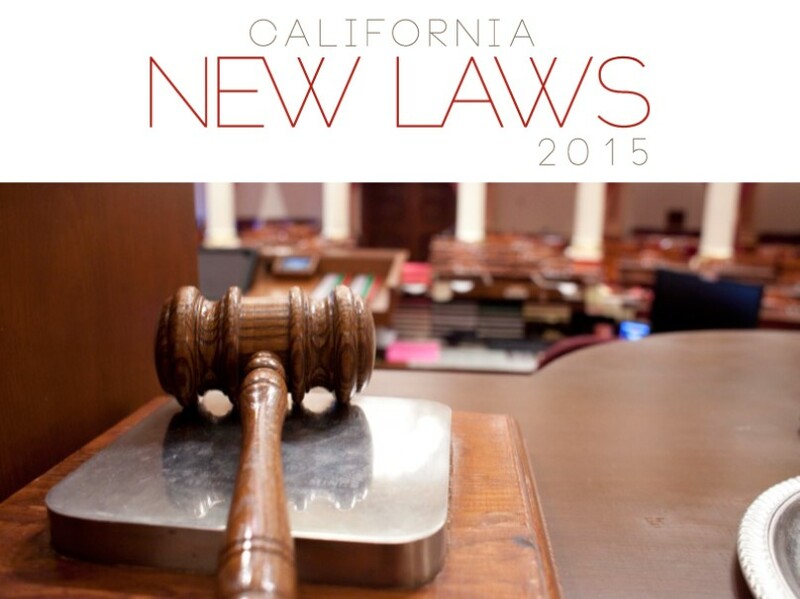 Reading that article along with this blog post will bring you into the know for employment laws in 2015. Below are new California laws that go into effect this year to impact the daily operations and policies of California businesses. AB 1522, the Healthy Workplaces, Healthy Families Act of 2014, requires employers to provide paid sick leave to employees who, on or after July 1, 2015, work in California for at least 30 days within a year from the employment start date. The accrual rate will be one hour for every 30 hours worked, and an employee will be entitled to use accrued sick days beginning on the 90th day of employment. An employer will be authorized to limit an employee's use of paid sick days to 24 hours or 3 days in each year of employment. Under previous law, volunteer firefighters, reserve peace officers, and emergency rescue personnel were protected against discrimination from an employer for taking time off work to perform emergency duty. Emergency rescue personnel had been defined as an officer, employee, or member of a political subdivision of the state, or of a sheriff's department, police department, or a private fire department. AB 2536 expands the definition of emergency rescue personnel to be eligible for protected time off for emergency duty. The definition now includes an officer, employee, or member of a disaster medical response entity sponsored or requested by the state. The bill also states that an employee who is a health care provider must notify his or her employer when the employee becomes designated as emergency rescue personnel and when the employee is notified that he or she will be deployed because of that designation. AB 1443 adds unpaid interns and volunteers to the list of individuals protected from harassment and discrimination based on specific characteristics under the Fair Employment and Housing Act (FEHA). Discrimination against any person in the selection, termination, training, or other terms or treatment of that person in an unpaid internship, or another limited duration program to provide unpaid work experience for that person, or the harassment of an unpaid intern or volunteer, is an unlawful employment practice. These provisions apply to employers, labor organizations, employment agencies, and specified training programs. AB 1660 makes it a violation of FEHA for an employer to discriminate against an individual because he or she holds or presents a driver’s license issued to undocumented persons who can submit satisfactory proof of identity and California residency (known as "AB 60 driver's licenses"). Such discriminatory actions will constitute national origin discrimination under FEHA. AB 1660 also states that it's a violation of FEHA for an employer to require someone to present a driver's license, unless possessing one is required by law or required by the employer in a requirement that's otherwise permitted by law. Any driver's license information that an employer obtains must be treated as private and confidential. AB 2751 prohibits an employer from discharging or discriminating, retaliating, or taking any adverse action against an employee because the employee updates or attempts to update personal information based on a lawful change of name, social security number, or federal employment authorization document. The bill also expands the definition of unfair immigration-related practice the threatening to file or the filing of a false report or complaint with any state or federal agency, not just threatening to file or filing a police report. AB 1792 prohibits an employer from discharging or in any manner discriminating or retaliating against an employee who enrolls in the Medi-Cal program and from refusing to hire a beneficiary for reason of being enrolled in the Medi-Cal program. It also requires state agencies to prepare an annual list of the top 500 employers (defined as having more than 100 employees who are beneficiaries of the Medi-Cal program) who have the highest number of employees enrolled in a public assistance program. These reports will be public and will be prepared starting in January 2016. Existing law requires employers with 50 or more employees to provide at least two hours of training and education regarding sexual harassment to all supervisory employees, and this training must occur once every two years. AB 2053 expands this training and education to include prevention of abusive conduct, defined as conduct of an employer or employee in the workplace, with malice, that a reasonable person would find hostile, offensive, and unrelated to an employer’s legitimate business interests. Previously, an applicant for a license to act as a farm labor contractor had to participate in at least 8 hours of educational classes each year. SB 1087 increases the requirement to 9 hours and requires that at least one hour of sexual harassment prevention training is included in those classes. SB 1087 also prohibits a license to operate as a farm labor contractor from being granted to a person who, within the preceding 3 years, has been found by a court or an administrative agency to have committed sexual harassment of an employee. A license can also be denied for someone who, within the preceding 3 years, employed any supervisory employee whom he or she knew or should have known has been found by a court or an administrative agency, within the preceding 3 years of his or her employment with the applicant, to have committed sexual harassment of an employee. In addition, the Labor Commissioner could revoke, suspend, or not renew a farm labor contractor's license for the same reasons. AB 1897 increases liability on employers who contract for labor. It requires an employer to share with a labor contractor all civil legal responsibility and civil liability for all workers supplied by that labor contractor for the payment of wages and the failure to obtain valid workers’ compensation coverage. This holds companies accountable for wage-and-hour violations that can take place if they try to use staffing agencies to supply workers and get around regulations. Existing law requires that employers provide rest or recovery periods, specifically cooldown periods to prevent heat illness, to employees who work outdoors. SB 1360 affirms that recovery periods taken for heat illness regulations are paid breaks that count as hours worked. Any employer who pays an employee less than minimum wage can receive a citation that includes a civil penalty, the payment of restitution of wages, and payment of liquidated damages to the employee. AB 1723 increases the penalty for a citation to include subjecting the employer to payment of any applicable penalties for the willful failure to timely pay wages of a resigned or discharged employee, also called "waiting time" penalties. Existing law allows an employee to bring a civil lawsuit against his or her employer for any unpaid balance of wages or compensation owed to the employee, who can then recover liquidated damages equal to the unpaid wages plus interest in a court action if the employee was paid less than the state minimum wage. AB 2074 says that a lawsuit for liquidated damages may be filed any time before the expiration of the statute of limitations for bringing the underlying action, which is three years.